Peshawar پشاور (Thursday, 01st February, 2018): The directorate of National savings of Pakistan will hold voting draw of Prize bond Rs. 7500 on 1st February 2018 (1.2.2018) in Peshawar city online. 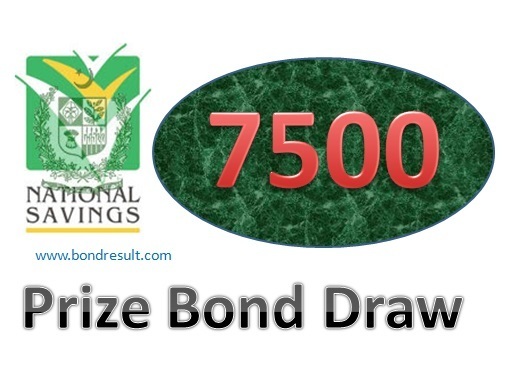 The rupee 7500 Prize bond draw no. 73 is a common draw serial reached to 73rd grade now. 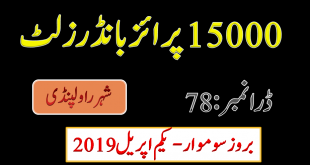 The Prize Bond List 7500 – Draw # 73 times is 9:10 am that’s result first and second winning digits will be public by Kohenoor TV live but the full draw of RS 7500 Prize bond Peshawar 1st Feb 2018 will be fully updated at 5:30 pm by bondresult.com and the official website of National savings of Pakistan savings.gov.pk. The time is not so far and the full draw result of Prize Bond List 7500 Result 1st Feb, 2018 will be shared publically on this page. The only Prize bond List Rs. 7500 is the medium range prizebond having prizes more that our thinking in Pakistani rupees. The draw of this denomination is public and the winning amounts are already defined by state bank of Pakistan on their website and also on National savings official website. The draw of prize bond result 7500 all have all the words you want but time may conclude the final papers for you that how is coming more on luck and what will be your next plan in prizebond investing. The prize bond list 7500 Peshawar 2018 is fully found on internet but the official results are displayed usually on night times. The best to find these prize bond list 7500 1 feb 2018 result is that you must visit bondresult at 5:00 pm and get the result updates with complete draw winning numbers. We share the whole list at once and you can search your owned prize bond 7500 form this new list 2018. 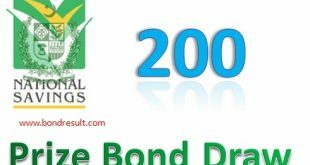 The rupp 7500 prize bond list 2018 online check by www.saving.gov.pk can be find here. The first prize of this seventy five Hundred prize bond is Rs. 15,000,000 (One Cror and Fifty Lac rupee) this is only for one lucky person having the first winning digits. The second prize amount of 7500 prize bond list 1 February 2018 held in Peshawar پشاور city is Rs.5,000,000/ (Fifty Lac rupee) that will be rewarded to three lucky winners who are also luckiest man of the nation who win this great money. The result of 7500 prize bond draw No.73 is showing that the third winning prize amount is RS.93,000/ thousand that have 1696 prizes and have good opportunities to win. The Prize Bond List 7500 Dated 1-2-2018 Held at Peshawar will be updated here very soon so keep visiting bondresult for more prize bond draw list result and news about National savings. The two great amount Prize Bond List 25000 & 7500 are scheduled on the same date of 1st February 2018 on Thursday. On this page you will see prize bond list 7500 Feb 2018 that is going to be listed here below. The latest 7500 prize bond list 1 February 2018 draw can be download here.